Centifolia Organic Damascus Rose Floral Water moisturizes, calms and soothes redness ! Known for its toning and anti-wrinkle properties, it promotes skin regeneration and is perfect for mature skin ! This organic hydrolat cleanses the traces of your make-up. With Centifolia Damascus Rose Water Spray, your skin is moisturized and soft ! 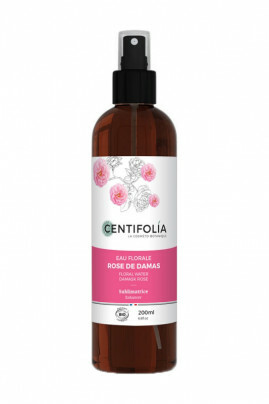 CENTIFOLIA Rose Flower Water moisturizes mature skin ! Apply in the morning and/or in the evening, Damascus Rose hydrolat to tone the skin and wake up the radiance of the complexion. Rose Floral Water is a real skin care product, it cleanses make-up traces. You can also spray a light mist on your face to enjoy its refreshing properties and gentle rose fragrance.